SIZE – C SERIES INFLATABLE BOAT COVER – fits Beam between 5.3ft to 5.7ft. There are 5 models in C series: C300 fits Max Length 9.9ft boat; C330 fits Max Length 10.8ft boat; C360 fits Max Length 11.8ft boat; C390 fits Max Length 12.8ft boat; C420 fits Max Length 13.8ft boat. MOTOR WELL STYLE & TRAILERABLE – Our boat cover should be able to cover your boat and the motor. Fabric Specs – Water repellent, mildew and UV resistant; Density 600D/260g/SQM. Elastic string design for quick fitted and released, Multiple Tie-Down Loops built-in, free cover carrying bag included. Max trailer Road Speed 65km / hour (40mile / hour), additional tie-down core will be required. 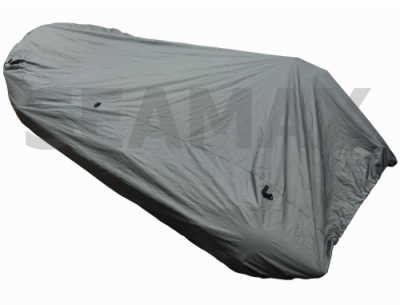 FULL SUPPORT – Seamax inflatable boat covers have 6 series and overall 25 models. Our boat covers can fit the inflatable boats from 6.5ft to 20ft. Each series includes couple of sizes for different tube styles & boat length. Our boat cover sizes under a same series should be with the same width. The bow style will not affect the cover size in most cases. MODEL CHECK LIST – If you have an Achilles, Mercury, Seamax or Zodiac inflatable boat, you can find your boat cover model from below Check List. Factor in the dimensions of additional features or boat style could affect the cover such as rounded pontoon cone end or tall center console. Please allow a few inches of additional length to fit your additional boat equipment when picking the cover. UNIVERSAL COVER – No matter which brand of boat you have, even if it is a RIB with a console, our universal cover should fit as long as your inflatable boat has a built-in transom.